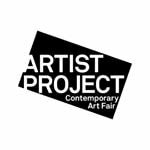 ​Nadia will be returning again this year to THE ARTIST PROJECT CONTEMPORARY ART FAIR from February 21 to 24, 2019. Come see her at Booth 1027! Click here to purchase tickets to the Artist Project!